People who have hamsters usually describe them as small creatures with enormous energy. After all, they have wild roots, which is why we need to create a stimulating environment for them to have a fulfilled and healthy life. Among the many gadgets you can get for your hammy, hamster tubes & tunnels are perhaps one of the most popular. 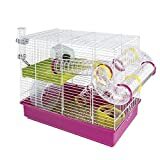 Here we shall discuss why are they a must for your hamster’s cage, which tubes are the best selling ones, and, if you happen to be a creative soul, give you the idea how to make a hamster tunnel or tube. We will also look at the pros and cons of buy a hamster cage with tubes and tunnels already attached. Why Are Hamster Tubes Beneficial? Let’s take a look at why hamsters find tunnels so attractive. When living in the wild, larger animals see tiny hamsters as tasty appetizers. For that reason they had to adapt to live underground, making that space their home, a place where they store the food and nest. Even though hamsters in captivity are safe from predators, that strong instinct to hide and remain out of sight is still there and it makes them explore and look for tunnels. That’s where hamster tubes come in handy. If you want to have a healthy hamster, you need to make his life fulfilled, by making his habitat stimulating and creative. They will enjoy exploring around knowing that they have a safe sanctuary to return to when they finish. As you know, there are many different types of hamsters, and many different types of tubes! The most important factor to consider is that the tube has to be the right size for your hamster! When buying a tube for Dwarf hamsters, it shouldn’t be problematic, but chubbier ones, like Syrian hamster, require more analysis. Make sure your hammy won’t get stuck inside and also be aware that sometimes he overstocks his pouches, and if he starts running through a tube like that, there may be a problem. Besides these factors, there are few more to take into consideration when getting a tube for your hamster. The ease of use itself matters, or else you will have a demotivated hamster if he doesn’t realize how to use it. The next is safety! Apart from size, ventilation is also an important factor when deciding on a certain tube. Make sure there’s enough of fresh air circulating through! The material itself has to be pet-friendly. Keep in mind that hamsters like to nibble on things, so you wouldn’t like to harm your animal. And last, but not least important, is the price. Try to find a balance between a smart price and a creative and interesting gadget for your hammy. The choice is wide, just take as much time as you need to buy the right tube! Of course, if you have the skills to make one, give it a try! You will have lots of fun, and your hammy will get a unique hamster tube! You can get some all-in-one cages and we cover those soon, but if you decide to buy each part separately, make sure they fit each other. Most brands work fine with other brands, but it’s not always the case. These colorful tubes will catch your hammy’s heart the moment he spots them! Easy to assemble, this tube provide a lot possibility to create a versatile endless maze. These tubes may be a bit small for Syrian hamsters, but if you are a dwarf owner, your tiny fella will have lots of fun playing inside. Seeing your hamster playing in a tube can be equally funny and amusing for owners as well. This creative pack is all your hamster needs! Not only tubes but other gadgets as well are part of this fantastic product. It fits all hamster sizes. The same fun-house as the previous one just made for dwarf hamsters exclusively. Be sure that your hammy will have hours and hours of pure fun exploring. This unusual playground may be a bit challenging to assemble, but once you do it, you’ll get quite a fantastic gadget for your hammy to play inside! So, what are few minutes extra compared to the hours of fun your pet will be having? 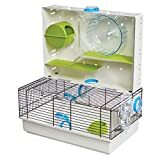 Now that you’ve decided on bringing home a pet hamster, you are left with the task of picking the best cage and toys for them. There are a lot of options out there, whether you are looking online or at your local big-name pet store. But how do you know which cage will suit the needs of your little friend, and what if you want some hamster tubes in it, too? Not all cages are created equal, and some are better suited for a specific size of hamster. For example, Syrian hamsters are larger than Winter White or Robo hamsters so they can be in a cage with wider bar spacing. Additionally, cages designed for dwarf species might come with smaller accessories that won’t accommodate a Syrian hamster. There are some pros and cons to cages that have intricate sets of tubes and tunnels in them. They definitely stand out the most when you’re in the store, but are they the best? Let’s go over some things you’ll need to keep in mind, and then we’ll show you some of the best choices for the aforementioned types of cages. 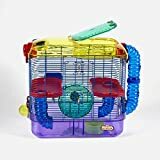 Hamster cages that come with accessories like attachable tubes have been popular for years, thanks to their cute designs and attention-grabbing color schemes. In their natural habitat, hamsters are known to travel through tunnels to escape predators and reach their destination safely. Although domestic hamsters don’t really need to worry about either of these things, it’s hard to ignore the intrinsic need to travel this way. Another benefit about choosing a cage with tubes is the additional space they provide and the encouragement to exercise. Of course, there are some disadvantages to choosing a cage with tubes. The tubes are usually difficult to clean and don’t accommodate air flow very well. Larger hamsters have been known to get stuck and trying to catch a hamster who is hiding in the tunnel system is difficult. We’ll let you decide on whether or not a hamster cage with tubes is the right fit for you and your little friend but in the meantime, here are our picks for the 5 best hamster cages with tubes. 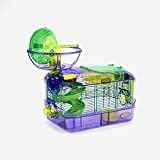 By far the priciest choice on the list, the Lixit Animal Care Savic Hamster Heaven is one of the most popular hamster cages available. The see-through tubes are great for knowing exactly where your hamster is, and the larger size makes them easier to clean. 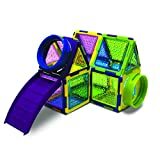 The Ferplast Hamster Cage comes with a long tunnel system that most hamsters should have no trouble traveling through. Like the first one we looked at, it’s basically a normal cage but with some tubes attached, which is a good way to go, compared to the large cages that are entirely made out of a series of intricate tubes. On paper (Or photo, rather…) this one looks awesome, it has a cool extension at the top that turns into what looks almost like an ant farm for your hamster, it’s a more narrow play area. In a perfect world, your hamster would do their business in the cage area below and only go up top to play, so that you don’t have to constantly clean out the top area… but we aren’t living in a perfect world. This isn’t our favorite option. This brand usually has some decent accessories for small animals, and we’ve recommended them in the past, but in this case it’s more of a budget option. The design is cool, it looks awesome, and the way the wheel spins is pretty awesome, but once things start to get a little dirtier, a little scratched up, it’s a whole different story. This one has similar criticisms as #4, but it’s bigger. Bigger is better in this case, it gives your hamster a little more space to play around in, and the base is deep enough that you can fill it in with a ton of bedding so that your hamster can borrow around. It doesn’t have the cool looking wheel like the last one, but it does have a wheel that functions better, so that’s a plus. You needn’t necessarily buy a tube if you have enough time and adequate material to make one. The only limit is your creativity, but keep in mind that the material has to be a safe one. If you use materials which are not transparent, make sure the hamster tube you make is spacious enough so that your hammy wouldn’t get stuck inside. The most popular materials and household items are cardboard boxes and toilet paper tubes, plastic water bottles or PVC pipes. Some people are handy with wood, as well. The good thing is you can decorate it also after you finish making it. It can be a simple tunnel, but you can also make a challenging maze with obstacles. Besides this, you need basic tools such as scissors and some tape to put all the pieces together. After you make it, try to test it. Is it the adequate size for your hammy, and is the construction itself safe enough? Creativity is important when deciding on a DIY hamster tube, but safety comes first! And here is a video that might help you in case you decide to make your own hamster tubes! As you know, hamsters may not be long living pets, but the energy they have goes beyond their size. All hamster owners know how easy is to become a hamster addict. So, providing adequate food and living space for your pet is essential, but it also needs to have a motivational environment. Only that way they will reach their full potential. While they’re no fun to clean, having some type of tube or tunnel for your hamster is important. They like to burrow themselves away, so various types of shelter are good, and this fits the bill. Having a cage with tunnels and tubes attached to it isn’t necessary, but it can be a fun addition, if you don’t mind a little extra cleaning work.